This project has been conceived as two separate but related residential accommodation types inspired by the unique nature of the site. The garden apartments are nestled into the gently sloping landscape. Each level of apartments opens onto terraces, courtyards and gardens. They are entered through a conservatory that gives views over the garden to the bay. The materials of stone, timber and masonry emphasise the relationship to the landscape while the large glazed doors and windows open to the view and fresh air. 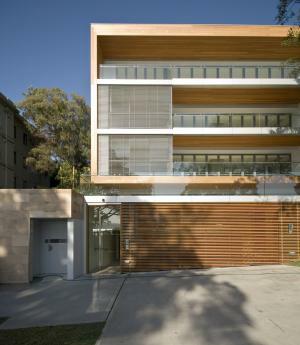 The pavilion apartments are created within a timber cubic structure with an expressed timber frame and louvre screens. This carefully proportioned pavilion is inspired by the nearby waterfront structures and wharfs made from ironbark and weatherboards. Automated louvres, sunscreens and large operable glazing shield the interiors from the sun, filter daylight and modulate vistas towards the Bay in response to the varying climate conditions and preferences of the occupants. Copyright © Domain Design. All Rights Reserved.